mwe3: The new album, Shore is being called your best album yet. Why did you release it as a Susan SurfTone album and not as a Susan And The SurfTones album? How did the album evolve and how would you compare the overall sound and vision on Shore with your earlier CD releases? 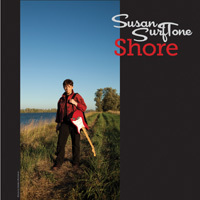 SUSAN SURFTONE: Shore is a solo effort with the exception of the drumming. Steve Kravac (Stephi SurfTone) played drums. The album really started when I got my Hofner bass and decided to learn to play it by focusing on McCartneys bass lines on Beatles songs. Then I started recording entire Beatles tunes with Audacity at home. After 90 Beatles songs were completed (yes, 90) I started working on some new original material, bass lines first. After home recordings of the first versions of the originals that found their way to Shore I moved on to recording some early Rolling Stones material, then Muddy Waters, then Robert Johnson, then Elvis Presley. By this time my guitar style had changed somewhat and those changes were brought out after a meeting with Steve in LA. Steve had listened to the first versions of the original material and made some insightful suggestions. During the six weeks before we went into Jackpot Studios I rewrote the originals and those are the versions on Shore. As compared to my earlier recordings, I think Shore has a much broader reach in style and influence. The songs are fleshed out more and the production is at a truly professional level. While rooted in surf, I think Shore has a broader appeal than my earlier recordings did. Maybe a few steps away from the niche. mwe3: The Shore album has such a bouncy kind of 60s flavored innocence to it. How did the sound of the 1960s change your musical life and what bands and artists made a big impression on your early musical upbringing, both pop and rock and instrumentally guitar-wise? SUSAN: My musical life is rooted in the 1960s. It was a great time to learn to play guitar. There was just so much great innovative music and rock music was expanding at a pace never matched again. I also have been a lifelong fan of rockabilly and Do-wop so there are some 1950s influences in there too. 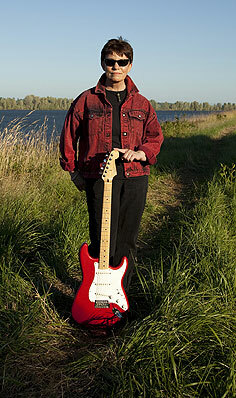 The Beatles and Elvis Presley were the major influences that caused me to pick up a guitar. The Rolling Stones, the British Invasion, The Doors and the American garage one-hit wonders loom large. The Myddle Class stands out as a major garage influence. mwe3: I havent heard an album, in a long time, that evokes the instro beat sound 60s as skillfully as the Shore album, yet you close the album out with an instrumental cover of Riders On The Storm originally released in 1971. Why did you choose that Doors track to close the Shore CD with? How did you approach Riders as an instrumental and can you describe the influence of that song and the overall Doors sound and the influence of Robby Krieger on your guitar playing as well? Did Robby hear the song yet? SUSAN: I usually covered British bands on my previous releases. This time I wanted to cover an American band. I chose Riders On The Storm because most of the original was instrumental and the interchange between the guitar and organ was very distinct. Its also a great song with a great but simple melody line. The lyrics are memorable and even though my version is instrumental you cant help but hear the lyrics. My approach to the song was to remain somewhat faithful to the original yet put some of my own stamp on it. The organ was a leap of faith because its not my instrument but I always love a challenge. 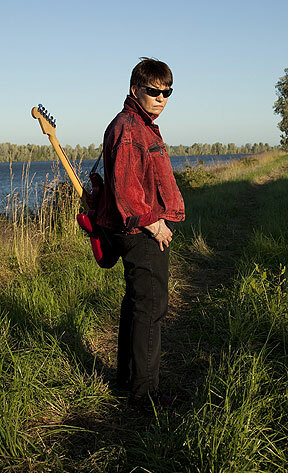 Over the years I have been playing Ive been told people hear The Doors in my guitar style. I did listen to them a lot in the 1960s and I think I may have just picked up some influences in my playing. I think Robby Krieger is a fantastic guitarist and he contributed greatly to the success of The Doors. I dont think hes heard my version of Riders yet. 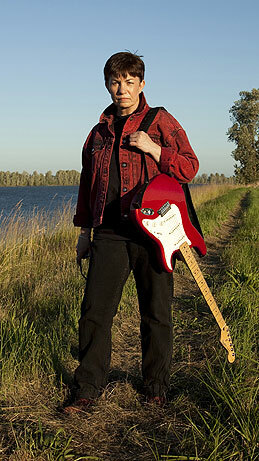 mwe3: Can you say something about where youre from originally and how you ended up living and recording in Oregon? Do you miss New York and can you compare the energy and artistic nature of New York with the more rugged, individualistic Pacific Northwest? Theres something to be said for having a unifying musical force in America these days! SUSAN: Im originally from upstate New York and I ended up living in Oregon much to my amazement. I will always be a New Yorker and I do miss it. Susan and The SurfTones developed in New York and I always appreciated the New York edge we had. Ive tried very hard to keep it here in the Northwest. The Northwest has a great 1960s garage history but its not as visible today as I wish it was. mwe3: What other musicians play and record with you on the Shore CD? Can you describe the chemistry with your band mates on this new album and also what was it like working with producer Steve Kravac and what did he bring to the table, musically, so to speak for the Shore album? SUSAN: Steve played drums. I played guitar, bass, and organ. Working with a producer of Steves caliber was a new experience for me. The record truly was a collaboration between me and Steve and it worked. Musically Steve gave a lot of the material direction. He had an insight into what I was trying to get at with the record that contributed substantially to making the record come alive. Steve is a great producer as well as being a great drummer. I was comfortable with him in the studio and that made the project fun. mwe3: How about guitars? What guitars are you playing on the Shore album and how has your choice of guitars changed over the years? Also can you remember your first guitar and what excites you mostly about the guitar world, musically and gear wise, these days? SUSAN: I played a Fender Stratocaster on the record. Mexican-made from the 1990s. My choice of guitars has recently expanded to include Gibson and Gretsch. Ill be playing a Gibson Melody Maker on my upcoming West Coast tour. My first guitar was a $30 acoustic, no-frills model. My first electric was a blue Kapa. I wish I had kept it. Im excited that more women are being recognized for being the great players they are. Im happy to see girls being encouraged to play by companies like Daisy Rock Guitars. mwe3: What are your plans for 2012 and beyond and what are you hoping listeners will come away with after listening to your new Shore CD? SUSAN: In February/March 2012 two east coast SurfTones, Kim13 (organ) and Brian Goodman (drums) are joining two west coast SurfTones, Dan Ferguson (bass) and Avory Gray (organ) and myself for a short West Coast tour. I expect I will start writing some new material in 2012. I hope listeners come away with a positive feeling after listening to Shore. I think we all need a bit of a lift these days and people have always turned to music for that.